Objective: Increase utilization of essential health services (public health, preventive and curative), particularly in underserved areas and among vulnerable groups, to accelerate achievement of the health-related Millennium Development Goals. At the time of the project’s appraisal, the State of Karnataka had achieved significant results in controlling non-communicable diseases and improving maternal and child health outcomes. Its population nevertheless continued to suffer from high levels of morbidity, undernutrition and mortality, which were compounded by wide geographical disparities. In 2002, for instance, 93 percent of women had delivered in a health facility in the best performing district compared to 18 percent in the lowest performing district (Peters et al., 2002). Further, despite Karnataka having a long tradition of government investments in primary healthcare services, emphasis was largely placed on infrastructure development rather than on the quality of care. Absenteeism, high vacancy rates and the lack of accountability and incentives not only resulted in wide health service gaps in the public sector but also enabled the private sector to increasingly become the first point of service delivery for most patients (i.e. 70 – 90 percent), including for the poor. The last payment occurred upon the achievement of verified health improvements – notably reductions in post-partum hemorrhage, preeclampsia, sepsis, and neonatal deaths. Control contracts that provide only information on best practices as other arms, but no financial incentives. The results were examined with a focus on rewarded inputs and outputs. Inputs included Pregnancy Care, Childbirth Care, Postnatal Maternal Care, Newborn Care, and Postnatal Newborn Care, while outputs included postpartum hemorrhage, pre-eclampsia, sepsis, and neonatal death. 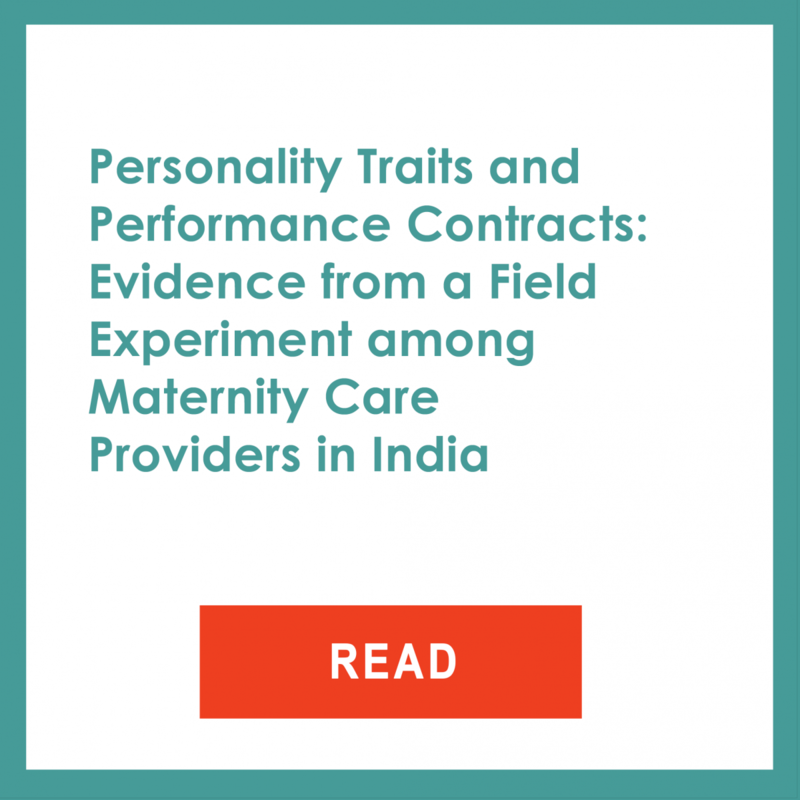 The study found that both output and input incentive contracts achieved comparable reductions in post-partum hemorrhage (PPH) rates, the dimension of maternity care most sensitive to provider behavior and the largest cause of maternal mortality. Incentive contracts enabled more than a 20 percent decrease in PPH. 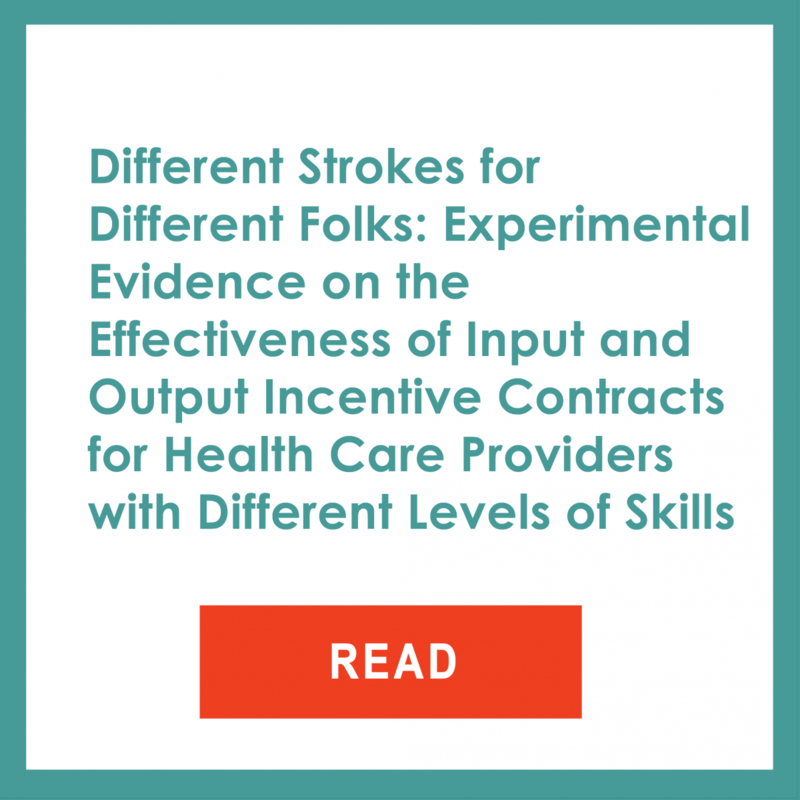 Interestingly, and in line with theory, providers with advanced qualifications performed better and used new health delivery strategies under output incentives, while providers with and without advanced qualifications performed equally under input incentives (c.f. www.cohesiveindia.org/incentive-contracts). The International Development Association (IDA) – a longstanding HRITF partner – supported the implementation of the Karnataka Health System Development and Reform Project which included a component designed to improve the quality, coverage and equity of tertiary care service delivery. The project supported a social health insurance scheme that purchased services from public and private hospitals using an RBF strategy. The program was gradually expanded by the government throughout the state – starting in one revenue division (i.e. Gulbarga) at the beginning of 2010, expanding to a second division (i.e. Belgaum) in 2011, and rolling out throughout the state in April 2012. Under this scheme, private and public hospitals were contracted to deliver a pre-defined package of 447 tertiary care services, encompassing areas such as cardiology, oncology, neurology, nephrology, neonatology and pediatric surgery, burn care, and major trauma care. This package – including 50 follow-up services – was coupled with a reimbursement schedule. The HRITF financed an impact evaluation of the IDA-supported Karnataka Health System Development Project to evaluate the effects of a government insurance program covering tertiary care for people below the poverty line in Karnataka, India, on out-of-pocket expenditures, hospital use, and mortality. The impact evaluation showed a significant effect on mortality and on reducing financial risk. The main findings were published in BMJ and widely disseminated in India, where they have had a significant impact on policy debates on universal health coverage.